The U.S. Transhumanist Party has concluded its seven-day electronic vote on the question of endorsing Gennady Stolyarov II for the Board of Trustees of the Indian Hills General Improvement District (IHGID) in Nevada in the 2018 general election. 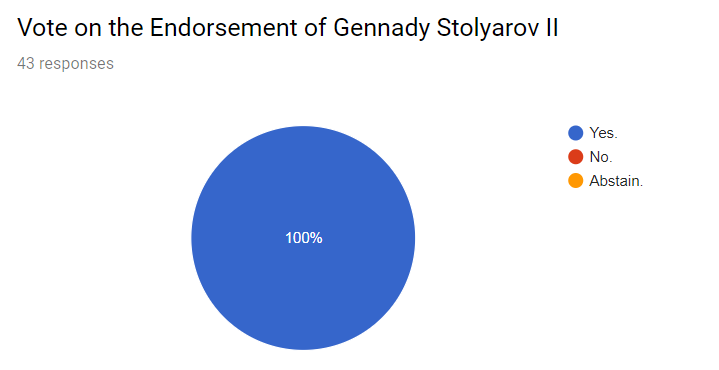 Of the 43 members who voted, 100% cast their ballots in favor of endorsing Mr. Stolyarov’s candidacy. During the vote, two members requested to be independent observers and received access to the vote results. Furthermore, all of the U.S. Transhumanist Party’s Officers received independent access to the vote results as well. Accordingly, the U.S. Transhumanist Party has an endorsed candidate who will be on the ballot in the 2018 general election. Questions about Mr. Stolyarov’s candidacy can be directed here. The U.S. Transhumanist Party will hold an electronic vote of the membership for a seven-day period ending on 12:01 a.m. U.S. Pacific Time on Monday, September 10, 2018, on the question of whether to endorse Gennady Stolyarov II who is running and on the ballot as a candidate for the Board of Trustees of the Indian Hills General Improvement District (IHGID) in Nevada in the 2018 general election. See Mr. Stolyarov’s campaign page here. Registered U.S. Transhumanist Party members as of 12:01 a.m. U.S. Pacific Time on Monday, September 3, 2018, would be able to cast their ballots on this question and will be sent their ballots via e-mail. Because Mr. Stolyarov is the Chairman of the U.S. Transhumanist Party, we shall strive to make every effort that the voting proceeds in as transparent and independently verifiable a manner as possible. Members are free to vote for or against the endorsement, or to abstain from voting, without any adverse repercussions for any decision made or in consequence of any outcome resulting from this vote. Every member is encouraged to make an independent, informed decision on this question. Any member of the U.S. Transhumanist Party who wishes to be an independent observer of the vote results may contact Mr. Stolyarov at gennadystolyarovii@gmail.com. All independent observers must promise not to disclose the names of those who voted to the broader public, although the independent observers may be privy to those names for purposes of verification of results only (and not for purposes of using this information to influence the outcome), and with the understanding that such non-disclosure must be adhered to. Mr. Stolyarov is officially running as a nonpartisan candidate for this nonpartisan office, and accordingly his name on the ballot cannot be accompanied by a political party designation. 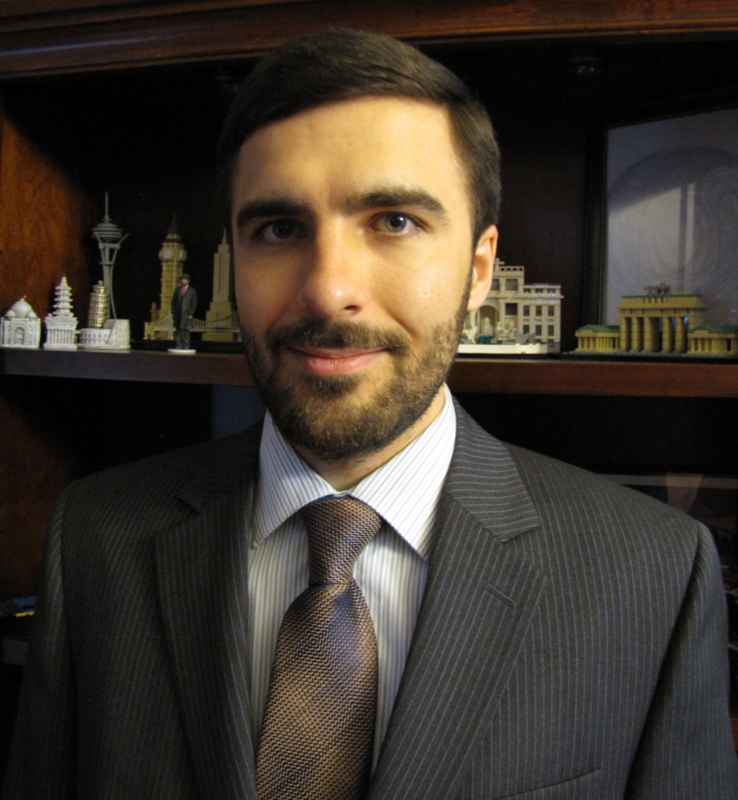 There are currently four candidates, including Mr. Stolyarov, running for three open positions. Accordingly, the significance of any endorsement by the U.S. Transhumanist Party would be symbolic in nature and would serve to bring greater attention to transhumanist ideas and how they could be instantiated in everyday, nonpartisan governance and an approach that can also appeal to the broader public, as Mr. Stolyarov attempts to do in his campaign. Furthermore, now that our previously endorsed candidate James D. Schultz has ended his campaign, the prominence of the U.S. Transhumanist Party would be aided by having an endorsed candidate in the 2018 general election, especially a candidate with a realistic possibility of winning the office for which he is running. Transcending political divisions: The IHGID Board of Trustees is nonpartisan, and I am running as a nonpartisan for this office. This means that I hope to represent everyone in this District, no matter what their political views or how they might differ from mine. Although we live in a politically divisive era, when it comes to a high quality of life in a neighborhood, we all have shared values that enable common ground to be found. We may not always agree on particular issues, or always reach an outcome that satisfies everyone, but I will strive to engage sincerely and transparently with each interested resident, and find creative solutions that meet as many goals of as many residents as possible. Putting facts first: Many of the decisions of the IHGID Board of Trustees are focused on specific knowledge about the water, sewer, and road systems within the District. I consider it crucial to gather as much factual information as possible about the workings of the affected systems, the available options, and the benefits and costs involved with each option, before making a decision. Every decision is a learning opportunity, and I promise to be open to the facts and to the input of those with knowledge and experience in the areas that the decisions affect. Ensuring that key infrastructure operates smoothly: We all want clean and safe water, well-maintained roads, and an effective sewer system. Additionally, the IHGID maintains parks that many residents enjoy and hosts events that improve quality of life for members of this community. These core functions are important and need to be performed well. Many people only notice them if there is a shortcoming, but the IHGID conducts valuable work in the background to prevent such shortcomings from arising. I will be attentive to this work, in large part so that residents can go about their daily lives smoothly. In my experience, there has been significant improvement in these areas during my time as a resident in the District, and I hope to encourage and work toward further improvement wherever possible. Respecting homeowners’ property rights: I espouse the view that one’s home is one’s inviolable personal domain. This means that choices about esthetics – such as home décor, color, texture, landscaping, outdoor furniture, statuary, and other purely visual elements – should be entirely within the discretion of a home’s owner. I oppose any plan to establish a homeowners’ association within the IHGID, and I support keeping the IHGID’s roles as currently defined. The only justifiable restrictions on a homeowner’s prerogatives should be considerations of the health and safety of others, as well as the ability of others to make rightful use of the common elements of the neighborhood. I support and encourage compliance with all IHGID policies and applicable provisions of law, including Douglas County Ordinances, and I also support being a good neighbor – which includes maintaining clean and visually appealing properties. However, much that is good about the appearance of our neighborhood can be and has been achieved informally and voluntarily – by people respecting others and arranging improvements amongst themselves. Not everything that is good should be mandatory. Parallel in U.S. Transhumanist Party Values and Platform: Individual privacy and liberty over how to apply technology to one’s personal life [Article III, Section I]; morphological freedom [Article III, Section VI]. Note: The freedom to use technology extends to basic and long-established technologies, such as those involved in home decoration, functional features, and furnishings. If one’s home is viewed as an extension of one’s self-expression, then the freedom to make esthetic choices for one’s home is a key component of morphological freedom. Pursuing technological solutions: I am a strong advocate of emerging technologies in a wide variety of realms. I will think carefully and thoroughly about which new advances can enable the IHGID to fulfill its purposes in a more effective and cost-effective manner, while only improving quality of service. Enabling resident initiatives: If you have an idea for an effort that will improve life in this neighborhood, and you are willing to implement it through your own hard work and that of people who agree with you, please feel free to reach out to me, and I will explore how this idea relates to the IHGID and how to enable your idea to be realized within the framework of the IHGID’s mission and goals. Supporting development that helps everyone and preserving valuable amenities: I believe that it is possible to have more of everything that everyone considers good. Life is not a zero-sum game; it can be positive-sum with the appropriate focus on win-win solutions and sincere consideration of how to improve from everyone’s perspective. I am a runner and hiker, so I enjoy open space and an abundance of trails nearby. I also consider additional residential development in the vicinity to be beneficial, provided that it is supported by adequate infrastructure – such as well-maintained roads, multiple outlets, and water and wastewater systems that amply provide for all residents’ needs. The real-world approach to particular situations involving preservation and development is often highly situationally specific, and could, in certain circumstances, be outside the scope of the IHGID’s boundaries and mission altogether. However, I promise to thoughtfully consider how our neighborhood and the surrounding areas are changing and to reach informed opinions regarding how any problems could be viably addressed. Through science, technology, rational thinking, and the consequent progress of our civilization, we are all tremendously better off than our ancestors were generations ago. We can continue the improvement on every scale, from local to global. Core Ideal 2: The Transhumanist Party supports a cultural, societal, and political atmosphere informed and animated by reason, science, and secular values. Commitment to fair campaign practices: I have signed the Nevada Code of Fair Campaign Practices and will abide by it. There will be three vacancies for the IHGID Board of Trustees on January 1, 2019. If more than three candidates run, and there is a possibility that some candidates might not be elected, I promise that I will treat every candidate with civility and respect. I reject negative campaigning and all personal attacks.